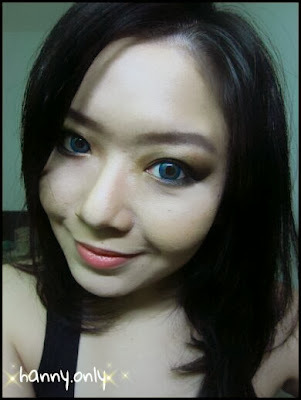 hanny.only: FOTD using Sariayu Trend Warna 2014 -- BORNEO..
FOTD using Sariayu Trend Warna 2014 -- BORNEO..
Hi readers.. So excited!! Cause one of my most fave local brand, Sariayu, finally launches their 2014 color trends.. like many years before, this year's trends also inspired from the richness of Indonesian natures and culture.. this time, Sariayu's trend color is inspired by BORNEO.. Here's the fotd!! 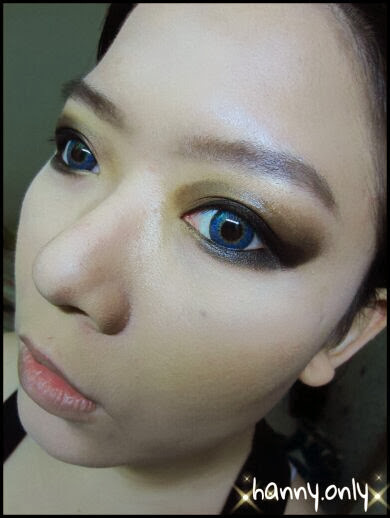 For the eye makeup, i'm using Sariayu Eyeshadow in Borneo B-03..
And for the lips i'm using the Borneo B-01.. I love the pinkish-orange look.. the lipstick itself also very soft and moistures my lips nicely.. it has a yummy bubble gum scent.. it's a first from Sariayu i think.. so cute.. Without the lipstick.. looked kinda dull, rite?!? Ok, that's it for now.. wait for another Sariayu Trend Warna 2014 product review soon!! btw itu relief di lipstiknya gampang ilang gak sih? ak baru swatch n pakai sekali sih.. agak tumpul sedikit.. belum tau juga kalau sudah dipakai bbrp kali bgmn.. nanti ku update yaa..
@Stephanie aww.. thank you, girl!!! :') appreciated it.. muahhh..